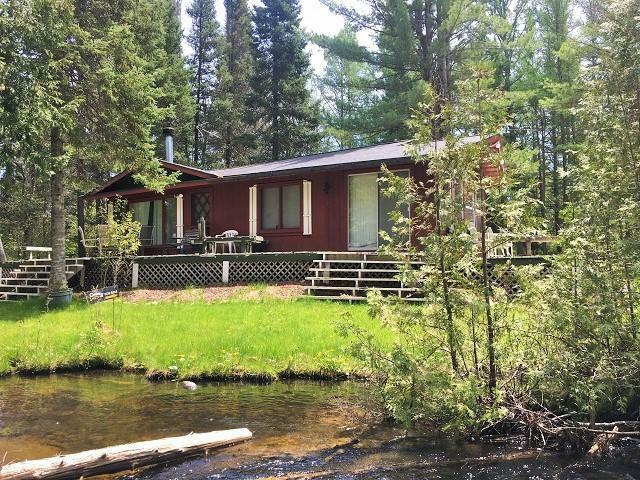 COZY CREEK SIDE CABIN IN LUZERNE- Steps away from the West Branch of the Big Creek's edge just N. of Ma Deeters. Secluded 1.3 ac. at end of a private drive with direct 188+/- ft waterfront. Bring your fly rods, wading shoes and even the dog. The whole family can relax. Interior has impressive stone fireplace with wood stove and electric baseboard heat, 2 BR, 1 bath, T & G pine/wood ceilings & walls. Surrounded on 3 sides by decking to relax & take in all the sites and sounds of nature. You can't build this close to the to the AuSable tributaries anymore. This is a one of a kind opportunity to own your slice of waterfront heaven. FYI Do Not use GPS to get here. Go straight to Mio and West to Luzerne to property.